It's very rare that I go to bed excited about the next morning's breakfast. As it happens, unless I predict some sort of McSandwich or a meat-heavy full English the first meal of the day tends to be one I don't really get too worked up over. This is a breakfast to get excited about. 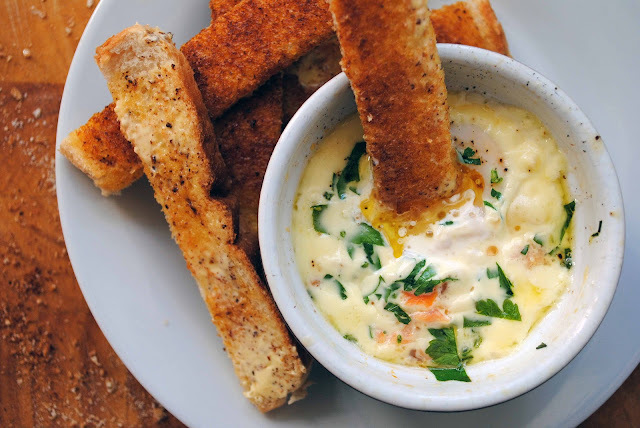 Creamy, herby and smoked-salmony...it's pure decadence in a ramekin, best enjoyed after an epic lie-in. Not only is this little pot of greatness a tasty treat, it's very simple - ideal for first thing in the morning, or a groggy midday brunch. Grease a ramekin with butter and scatter smoked salmon across the bottom. Add a tablespoon-ish of double cream and about the same of chopped parsley. Season with salt and pepper and crack an egg on top and add another tablespoon or so of salmon, cream and parsley. Pop into a baking tray then fill the tray with boiling water until it's about halfway up the ramekin, a bains marie if you will. Stick into a pre-heated oven at about 190C for 15 minutes, or until the whites have set and the yolk is gooey. Serve with some buttered soldiers and dig in. This is Sunday morning eatings at its finest. Might hint at it for my bday breakie! glad you enjoyed it! i'm a smoked salmon junkie so this is the perfect breakfast for me.